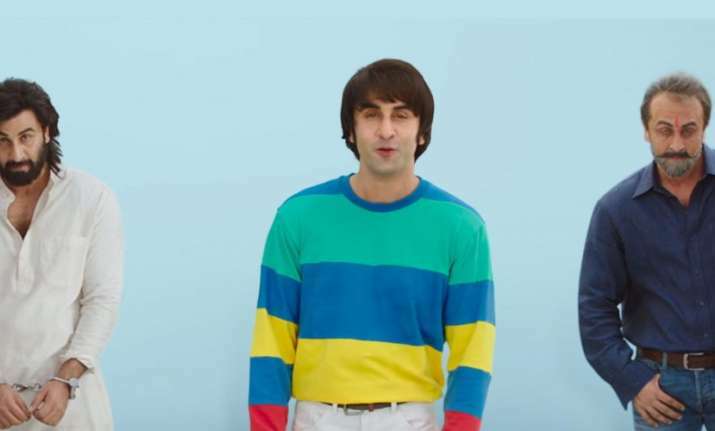 Bollywood actor Ranbir Kapoor has wowed everyone with his uncanny resemblance to Sanjay Dutt for his upcoming film Sanju. Now, the trailer of Rajkumar Hirani’s film will release on May 30. Ranbir’s transformation depicting different phases of Sanjay’s life has been lauded. Hirani released multiple posters of the film, revealing the varied looks of Ranbir from the biopic. Written and directed by Rajkumar Hirani, the film will also stars Paresh Rawal, Manisha Koirala, Vicky Kaushal, Sonam Kapoor and Dia Mirza, amongst others. Produced by Vinod Chopra Films and Rajkumar Hirani Films in association with Fox Star Studios, the film will release on June 29. The teaser has already piqued audience interest in the movie, which showcases the highs and lows during various phases of the actor’s life. Sanju is an ambitious project of Rajkumar Hirani with Ranbir Kapoor in the titular role. The actor built muscles for the role and his beefed-up look already went viral on social media. The movie has an ensemble star cast comprising Manisha Koirala, Dia Mirza, Vicky Kaushal, Karishma Tanna, Sonam Kapoor and Anushka Sharma. While Manisha is playing Dutt’s mother Nargis in the movie, Dia will be seen as Maanayat Dutt. Reportedly, Anushka will play a journalist in the Dutt’s biopic. Birth Anniversary Special: How Sunil Dutt shuffled his way into Bollywood from bus depot!